"It aint just a suite, its your own mexican home"
El Pueblito Sayulita - Much more than a boutique hotel, with rooms that rival the size and comfort of a Mexican home, perfect for long stays with family or friends. Our service will compare to a five diamond resort, and we offer all-inclusive options, the first in Sayulita! We are a Mexican company that is fully committed to the environment and to the lovely town of Sayulita. Spacious and fully equipped rooms that provide the comfort and feeling of having your own Mexican home. 20 of our 25 rooms have a terrace area or independent balcony. Terrace palapa bar with Balinese beds for lounging in the moonlight, copper tubs. Adults Only! Bar Capacity 150 pax. *Beach Club It is not an extension of the hotel, Bed and breakfast or all-inclusive does not apply. Any extra charge will have to be paid at the Beach Club or charged to the room. *Beach Club is open to the public. `Mexican Double floor suite, approx. 450 square feet, with 2 independent Bedrooms, 2.5 Baths, sleeps 4-6. One King bed, Two standard beds, one sofa with pull out. 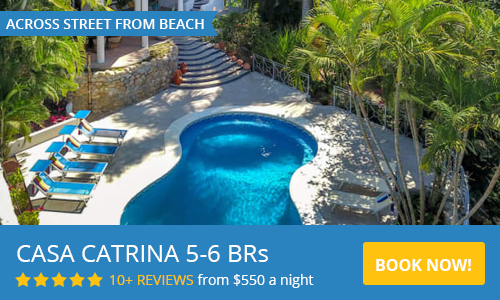 Great for the entire family, the Master Terrace Home is the perfect option if you want to enjoy your beautiful Sayulita vacation and the lovely beaches with room for everyone. 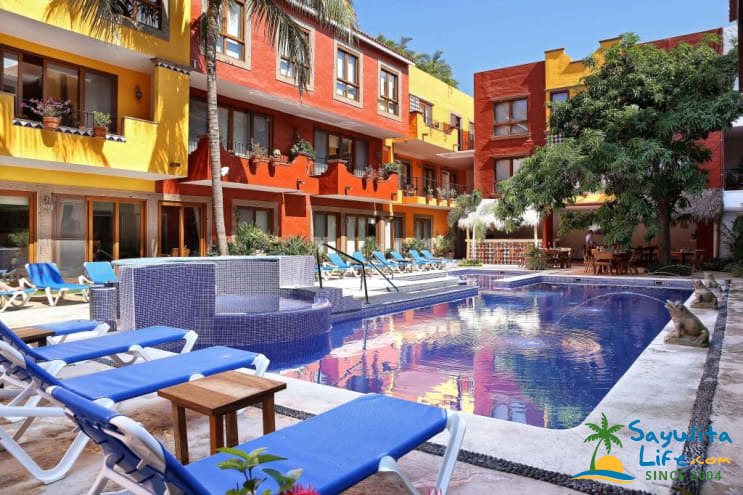 This room will make you feel that you are inside a true Mexican home, with terrace overlooking the pool and common area. Perfect for longer stays. Balcony Junior Suite - Perfect for a couple - ADULTS ONLY! 1 Bedroom with King bed, 1 Bath, for a total of 2 guests. This lovely home will provide comfort, privacy, and security. Great for long stays. Overlooks pool and common area. Please contact us via the form to request a reservation and confirm the pricing. We look forward to welcoming you to the El Pueblito Sayulita experience! Our room and the grounds were immaculate! Ivan, Patti and Xavier went out of their way to make sure the 6 of us (3 rooms), were well taken care of! The Hotel is a few blocks from the hustle and bustle which made it very quiet. El Pueblito offers a friendly host staff, beautiful environs and spacious rooms! We'll be back! The hotel was nice and clean. We had an overall good experience. We were happy with the overall hotel experience. The front desk staff was very helpful and friendly. The hotel rooms were clean. The experience at the restaurant was not as good, I suggest not including breakfast in your reservation and try other places around. We came to Sayulita for a bachelor party in May. From day 1 Javier, Carlos, Ivan, and Luis have been more than accommodating. This hotel is brand new. The rooms are beautiful if you need time to relax or time to party by the pool this is the place to be. The beach, bars, and restaurants are an easy 5 min walk with no hills. This is easily the best Mexico experience I have ever had. Thank you to the great staff at El Pueblito de Sayulita. From the moment we walked into the lobby of El Pueblito hotel in Sayulita, we knew we had picked a winner. The rooms are extremely clean and tastefully decorated. Javier in the office went out of his way to accommodate us in any way that he could. The first three nights we stayed in the compana room. We liked it so much we came back the following week and stayed in the El Cameron room. Both of these rooms were so comfortable and clean. We felt like we could stay here forever. Both rooms have a kitchenettes and everything we needed for our vacation. The location is very very close to downtown center. We are only two blocks away from everything. The pool is lovely and very inviting. Their mixologist bartender Carlos is excellent and specializes in exotic drinks. Julie in the office is always on hand to help us with everything we need! If I could add five more stars to this rating and give this place a 10 starI would. This place is a must if you stay in Sayulita! We loved our stay at El Pueblito. Javier is a champ and appears whenever he’s needed, so very helpful. The pool is one of the best we saw in Mexico, and the pool bar drinks and restaurant are delicious. Definitely will recommend this hotel to friends. This was my very first visit to Sayulita Mexico. My wife and I stayed at the Hotel El Pueblito de Sayulita which is described as a boutique hotel, I can add picturesque to the description From day 1 Javier was most accommodating, he is totally awesome, anything you need just ask for him! This hotel is new and the rooms are beautiful. The beach, bars, and restaurants is an easy 5 minute walk. This is easily the best Mexico experience I have ever had. Thank you to Javier and the staff at El Pueblito de Sayulita. We visited Sayulita for the first time in March for our spring break vacation. We stayed at El Pueblito de Sayulita and we absolutely loved the hotel and the location. As you can imagine, spring break brought lots of people to Sayulita so the streets were packed with vacationers. This hotel is located a few blocks away from the center of town which was perfect for us because we did not want to be in a hotel where the streets were crowded and music was blasting. The location of this hotel allowed for some peace and quiet. The rooms were great, including the bathrooms and everything was very clean. The suite came with a kitchen that was stocked with general kitchenware so we could make a few meals if we chose to. The pool was clean and the food at the onsite restaurant, Ximena'z, was great. If you don’t get a chance to stay here, you should consider eating here. Javier made sure we enjoyed our accommodations and made excellent recommendations when we traveled outside this little haven. He even helped us schedule an in-room massage that was well priced and professional. We will definitely be back to this place. El Pueblito was a beautiful hotel. The rooms were clean and the pool was perfect. Located right in Sayulita yet away from the center. Sayulita was a short walk to all the town has to offer. And Javier at the front desk was incredible! He made our trip! Anything we needed to know he had the answer. Best trip to Mexico we have had so far! For your security, you can pay with credit card via Paypal, or we also accept bank transfers to our bank here in Mexico if you prefer. Our rental rates start from $165 USD to All Inclusive $680 (high season rates) USD/night. Mexican Citizens with proof of citizenship receive a 15% discount off regular rates. All prices are in USD per night! Contact us for your personal quote! “IT AINT JUST A SUITE, ITS YOUR OWN MEXICAN HOME”We are a 100% Mexican company, committed to the environment and the beautiful Sayulita town, which seeks to raise the customs and traditions of Mexico from the heart of Sayulita. Offering an innovative concept of "Pueblito Resort" that goes beyond a boutique hotel, with rooms with size and comforts of a Mexican home, special for long stays and service compared to those of a 5 diamond hotel, with the option of " All Inclusive ", for anyone who wants to enjoy with his family or his partner, a paradisiacal vacation, full of unforgettable experiences with a warm, friendly and personalized service, distinguished by Mexicans. So anyone could live in Sayulita, "The Mexican Experience".